Shhh…you guys hear that? Sounds like some kinda music…it’s just over this dusty ridge. Yeah, it’s music. And they’re singing about…some guy named Leo stuck in a cavern. Oh! It must be Ace in the Hole, Billy Wilder’s blistering indictment of American sensationalist culture! 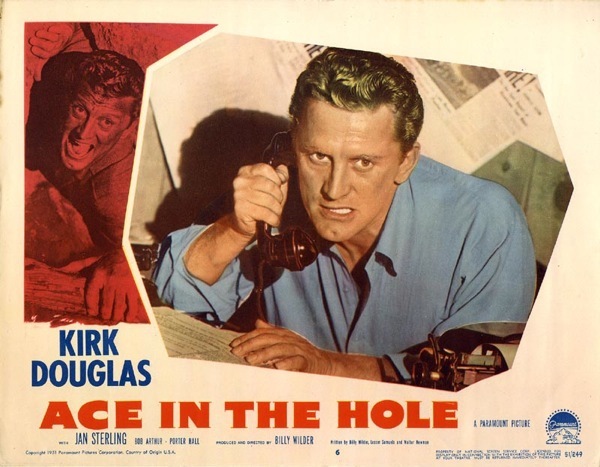 Initially deemed too cynical on its release in 1951, Ace in the Hole stands today as powerfully ahead of its time. The public loves a good, rotten news story about death, that’s never changed. What Wilder does here is place the spectators, the politicians, and the journalists on the chopping block for the crime of producing such a vile atmosphere where the good people are exploited by the media to make a buck.